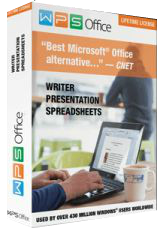 WPS Office 10 Business is a leading productivity office suite including Writer, Spreadsheets and Presentation. It has the best compatibility with Microsoft Office and enables you to create high-quality documents effortlessly. Please note: the program includes one year license! Click here to get WPS Office 10 Business 1 Year license.